The UEFA Champions League draw has been completed in Monaco this evening. 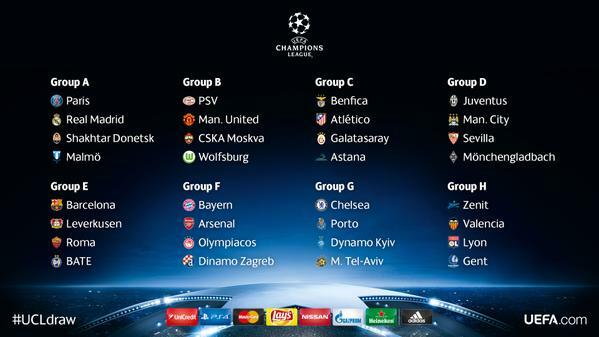 Premier League giants Manchester United and Chelsea will be happy with a relatively easy group. The same cannot be said about the Premier League runners up, Manchester City, who have been drawn in the group of death once again. The Citizens will be fighting for their place in the knockouts against the likes Juventus and Sevilla. Real Madrid and PSG are favorites to make their way out of Group A. Shakhtar could pull off a surprise result, but are likely to fall short eventually. Passionate Swedish outfit, Malmo are way too weak and unlikely to cause any shock. Manchester United and Louis Van Gaal will be happy with their draw. CSKA are not what they used to be and PSV have been stripped of their star players this summer. With Kevin De Bruyne headed to Manchester City, United should make it to the knockouts easily. Atletico Madrid are firm favorites to win the group against the likes of Galatasaray and Astana. Benfica should have enough to qualify as the second placed side from the group. Group of death, undoubtedly the toughest one. Manchester City are once again up against it with Juventus, Gladbach and Sevilla all capable of beating each other. Champions league winner Barcelona have a competitive group with the likes of Roma and Leverkusen. However, the Spanish giants have too much firepower and will win the group with ease. Arsenal and Bayern Munich is becoming a bit of normality in the Champions league. Wenger will be hoping for a better European campaign this time. Bayern and Arsenal will prove way too strong for the other two in the group. Chelsea have once again been handed one of the easiest groups and Mourinho’s men should easily progress into the knockouts. Porto and Kiev will fight it out for the second qualification spot. Group H is tricky and competitive. If Valencia can organise themselves and sign a good defender, they should be able to top the group. Zenit and Lyon are no pushovers and qualification will hinge on home performances. Did Brendan Rodgers' tactics spoil striker's Liverpool career? Chelsea won’t have it easy against Porto, but they will come out on top by a large margin.